Sometimes all it takes is a fun prop to dramatically change the way you interact with the world around you. I ended up live Tweeting my entire day from then on out. And I’m so glad I did. Here’s what happened next. *Point of note: This was also the “inner voice” that won during last year’s “should I get a whiteboard into my apartment via the roof?” charade. I’m starting to think life is a lot more fun when I give into this voice. I started off lugging my frame around much like you might maneuver a suitcase through Manhattan — apologetically and discreetly. I snapped my first few photos on the subway during my morning commute, but I soon discovered that the size of the frame itself made it difficult to simultaneously hold it myself and take a photo at the same time. While many passengers saw me struggling to capture an appropriate angle of my morning subway car, one woman stepped up to help. She literally got up from her seat, put her bag down, and asked: “Would you like me to take your picture in the frame?” This definitely caught the attention of everyone else in our train. What’s she going to do? they wondered. “Sure!” I replied. I set down my bag too, and she snapped a few photos from three different angles on the train. With that one move, she helped me unlock an important key for the rest of my day: I’d need to lean on people around me to help me get the best photos. After my morning breakfast meeting, I had a 15-minute walk to the office, and that’s where things got really interesting. While I started to get clever with how I’d place the frame to get a photo that I wanted, I decided to start taking some chances with strangers on the street. When I saw a neon script sign that said, “Art,” I knew I wanted to capture the meta photo with that inside. As I was eyeing the scene, a FedEx delivery man walked by. He hesitated for a minute, assessing my motives. 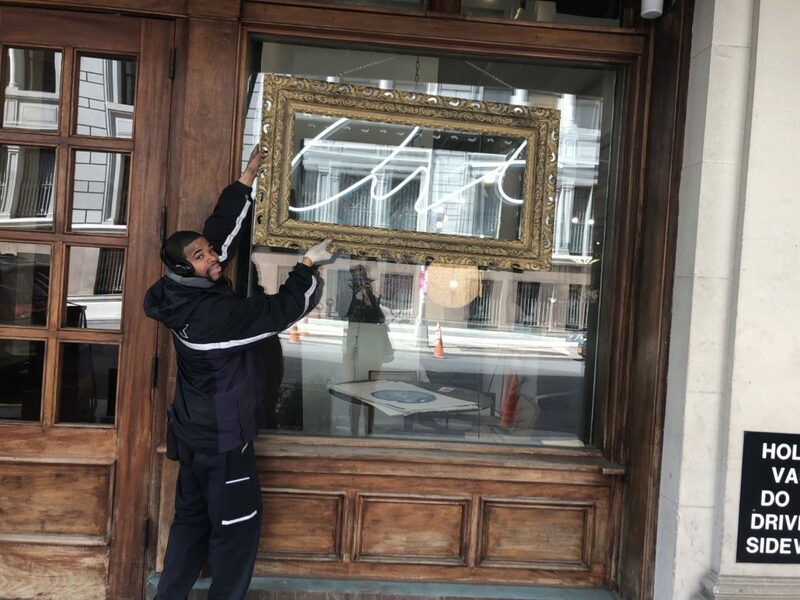 I handed off the frame and stepped back to the sidewalk while he held it up high. When I looked at the scene through my phone, I couldn’t help but smile. Sure, framing “art” was cool. But having him in the photo made it even better. On the rest of my walk to the office, I got a little bit bolder, inviting strangers on street corners to help me take better photos. My favorite one from the morning was when I invited a group of non-English speaking tourists to “frame” the Empire State building for me. Pure joy. Once it became clear that this was a game, I found it even easier to find people to play along. Back at work in the afternoon, I’d started to get the attention from my colleagues, who happily joined in a few in-office photo stunts that day. After a few meetings, I decided that I was all in now, so when I left to grab a bite to eat, I took the frame with me. 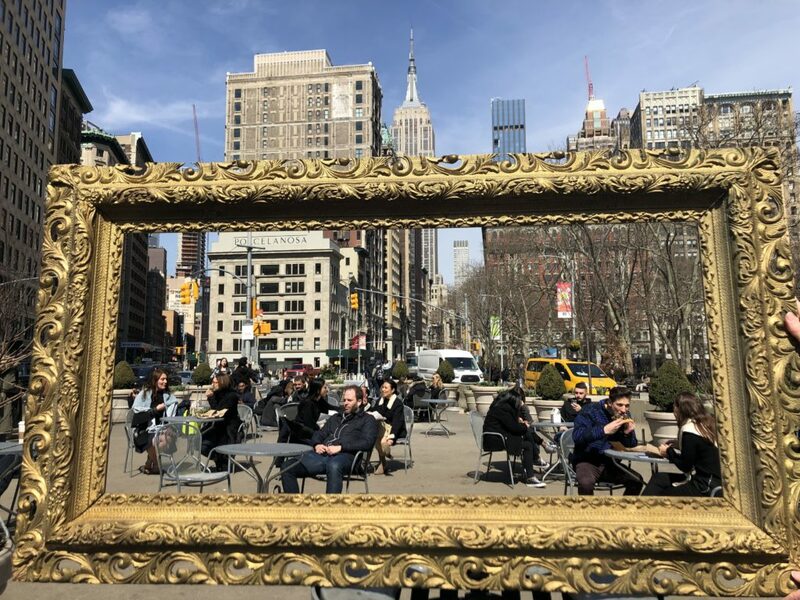 My favorite part of the day was probably the 20 minutes I spent at the Madison Square Park triangle, inviting tourists taking selfies to use my frame for their iconic photo views. A few people wanted their own photos in the frame and had a lot of fun with the unexpected prop. A tourist from the UK helped me find the exact right place to snap this photo. Then we followed each other on Twitter. 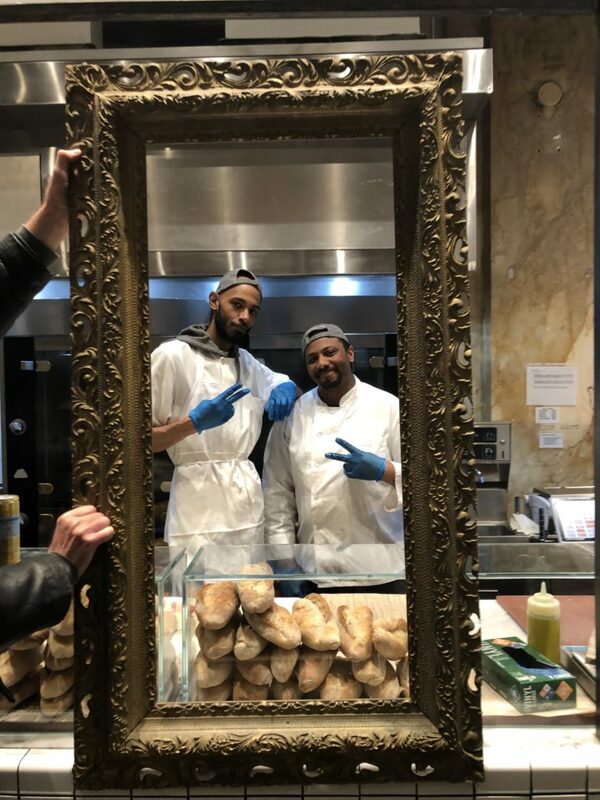 I wasn’t sure how the staff at Eataly would react to a girl lugging a frame through their already crowded market during the lunch hour, but within a few minutes, I found a couple of eager volunteers to help me capture this moment. I asked if they wanted a family photo with my frame. They smiled bashfully and politely declined. My biggest test yet for the frame was yet to come — Could I take it with me to the Affordable Art Festival that night? I’d bought a ticket for the evening show earlier in the week, and I decided to stick to it. When I showed up at the registration area, a security guard asked me if I was exhibiting my frame in the show. “Oh.” A long pause followed. Multiple people at the fair approached me earnest and asked what booth sold me that frame. When I told them I hadn’t bought it here, that I hadn’t bought it at all, and in fact that I’d just happened to find it on the street that morning in the trash, it stunned and confused attendees and artists alike. I wondered how much people thought I had paid for a frame like this. “Spray paint it all gold,” someone urged. “I’m starting to get a sense of how your mind works,” said a gallery curator. “Does that mean you’ll let me take a photo with you and this frame?” I responded. He happily obliged. There’s a special sort of bond that you can form only when you invite people into a new world that you create together on the fly. And there are some things you can’t measure or plan or test. They just happen. If you carry a prop with you and decide that it’s art, you start to see art all around you. If you invite people to play, suddenly everything becomes fun. And whether tourists in a park, artists at work, or even colleagues for a business meeting, this simple exercise helped me break the script with everyone I interacted with yesterday. By the time I left the art fair to head home for the day, more than 300 people had liked, shared, or commented on my Tweet thread. I noticed people saying things like, “This makes my day” or “This gives me hope.” A few folks shared related immersive, interactive art exhibits from years gone by. And so many people — friends and strangers alike — just enjoyed following along. If there’s any lesson to be gleaned from this experiment, maybe it’s this: There’s a playful side to more people than you might think. Maybe we’re just waiting to be asked to join the game. 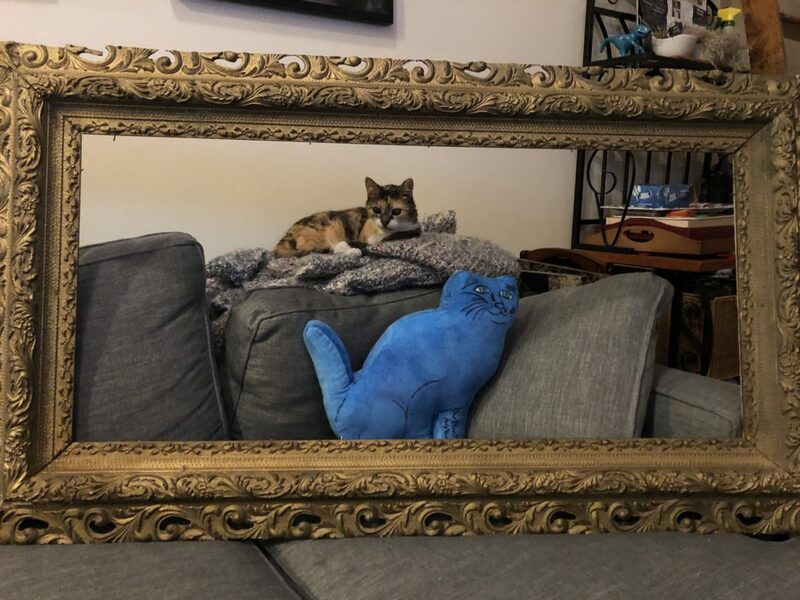 Here’s the end of my “frame thread” in case you want to follow along too.